NOTE: if you are not seeing several Greek looking letters and arrows in the line above, some UTF8 stuff got wrong. Sorry, I'll try to fix it, drop me a tweet! Nope. 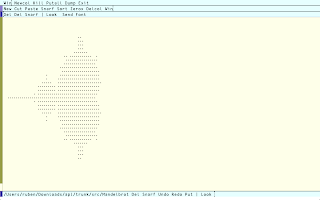 This is not line noise, but a complete APL program to display the Mandelbrot set in glorious ASCII, with asterisks and spaces just like Brooks and Matelski did a long time ago while studying Kleinian groups (it's a short paper, read it someday). I'll explain in (a lot, I hope) detail this line in a few moments. So, what's APL first? APL is literally A Programming Language. Funny, isn't it? Its origins can be traced back to a way to formalise algorithms created by Kenneth Iverson while at Harvard. It is famed as a very cryptic language, for a reason. Its fundamental functions are unicode chars, and at first it feels extremely weird. I got interested in it after finding an iOS interpreter for J, a programming language developed as a successor to APL, also by K.I. It just got away without Unicode, leaving only cryptic dygraphs, like <.@o. (from a Wikipedia example of high precision computing.) J is very cool, in that it offers a terse syntax to operate with matrices and vectors, very much like Matlab (Octave in my case) or R. But I felt I'd rather check the first idea, before diving into the even weirder syntax of J. So, it was APL. to make sure emacs and apl talk in utf-8. Without it, there are no commands to send to the interpreter! Since I'm also a heavy acme user, and acme is well-known in its unicode support, I used it instead to develop that line above. But emacs works correctly, I just like having things to tinker with acme. in APL yields 12 instead of the expected 10. You can change this with parentheses. Now that I have taken this out, we can analyse the line above. Instead of explaining it from right to left, I'll explain how I proceeded to develop it. And so on. In this particular case, after the first iterate we could stop. Remember that to do so, the product c·c is the product of complex numbers. So the first part I wanted to get out of my way was generating this iteration. There are several ways to do it in APL, but a very cool way I found was to first generate the required computation like above. How? This is essentially "many times" the string " c+m×m" There's a very very easy way to repeat stuff in APL. For instance, 3 ⍴ 1 (read 3 reshape 1) creates a vector with three ones, 1 1 1. Reshape essentially multiplies or trims vectors. But... 3 ⍴ 'tomato' is 'tom'. The reshaping also cuts, of course! What we need is to make APL treat the string ' c+m×m' as one element. This is done with the next instruction in the Mandelbrot line, as you may guess: encapsulate. generates a neat and long string of what the iterates should look like. To make sure the final string makes APL-sense, first we "enlist" with ∊. Turn the vector of repeated iterates into just one iterated element, like a long string all together. This could actually be removed, but it allowed me to learn a new function and I think it's pretty interesting. To end in a proper way, we add to the string a receiver variable 'z' and fuse the strings with comma. I know this was long, but the iteration was the trickiest part! Since APL is cool with matrices (and complex numbers!) we can assign to the initial c a whole matrix of complex points (our screen pixels) and then we'll have all the stuff required for the picture. This weird piece is just a compact way of generating a grid. To make it easier to understand, ⍳5 (that's iota 10) generates the sequence 1 2 3 4 5. To create a matrix we need two sequences (one for the x coordinates and another for the y coordinates.) For the complex numbers we can do 0J1 ⍳× 5 which yields 0J1 0J2 0J3 0J4 0J5. As you may guess, 0J1 is just the complex number i. For some weird reason APL uses the j letter instead of i. No big issue. Now we have the x's which go from 1 to 5 and the y's which go from i to 5i Now we need to find all the complex points in the plane. This means adding one of each x to each y, to get a grid. Similar to a multiplication table, but with sums instead of products. APL magic to the rescue! which is pretty close to what we need. To plot the Mandelbrot set we are only interested (mostly, and in this particular instance) in points with real coordinate x between -2.1 and 0.5 and complex coordinate between -1.3 and 1.3 (just to make it square which is easier.) This long blurb just adds a matrix similar to the one above to a complex point, generating the grid of points we want, and assigns it to c. Almost done! We have a neat string which can generate a matrix of 1s and 2s and represent the Mandelbrot set. How do we make this string compute something? Magic! Since a matrix can be used to index a vector, we use this newly computed matrix as indexes (i.e. between square bracket) with the vector ' *' so we get almost a Mandelbrot set. But since I was slightly lazy when generating the grid of points, it is transposed. ⍉ (transpose) fixes it and finishes the program. Writing this line of code took me quite a long time, mostly because I was getting used to APL and I didn't know my way around the language. Now that I'm done I'm quite impressed, and I'm looking forward to doing some more fun stuff with it. And if possible, some useful stuff.